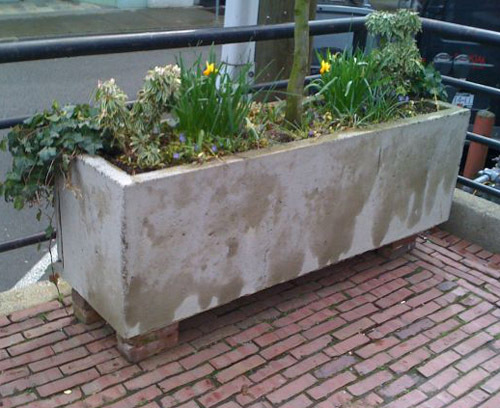 Concrete planters. What happened? Whither minimalism? Whither design? Whatever happened to planters like these two? They may still be in production, but wherever they are still available, and that’s nearly nowhere, they’re civic-sized, weigh 500-1000 pounds, and are out of scale for people’s home gardens. Why? Whither modernism for domestic landscaping? After a golden age of simple, sophisticated design in the 60s and 70s, the commercial design industry is taking us in the direction of cheapness, ornateness, bad nostalgia and the whole philosophy that goes with it.